When Cooper, an obnoxious dude-bro of an American, needs money to fund his European walkabout, he agrees to pilot test a new game from a secretive designer. Then, things happen. Black Mirror usually succeeds at presenting both fascinating tech and compelling characters. In “Playtest,” though, the tech is a combination of banal (when I thought it was just a really good virtual-reality system) and then rather unbelievable (once we find out what really happened). The show continues to excel at characterization, though. 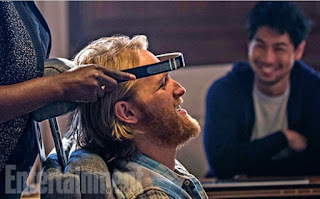 Actor Wyatt Russell manages to bring humanity to a character type I dislike: the dude-bro who asks the sort of questions that make you want to hand them a card with “You can google that, you know” on one side and “Is that really the important thing, anyway?” on the other. Bearing that in mind, perhaps the most interesting thing this episode has to say is: Why would you trust a game developer with your brain? By extension, why would you value game tech in such a way that it impacts the whole world, far beyond recreational activities? Those are questions that some people are asking already, as in this New Yorker profile of Y Combinator guru Sam Altman. He might be trying to save the world. We might want to ask if we want him to be the one to do that. • I’ve read some criticisms online that point out that the “game” aspect of the game isn’t very gamey. I don’t really game, so—okay. • Interesting that this episode raises the specter of the singularity with the books in Sonja’s apartment. The mind’s “inability to comprehend [technology]” (as Wikipedia describes Kurtzweil’s definition of the singularity) seems like a nice way of describing what happens to Wyatt. • I loved the montage of Wyatt’s travels. It was so cliché and aware of its own clichéness. I kind of don't get the criticism? I mean I guess this episode wasn't as deep as others, but it scared the crap out of me. Like kept me up at night level scared. The false endings were completely expected but I thought the episode would end with Cooper dying of Alzheimer's then waking up at the gaming company. I guess that would be too upbeat for the Black Mirror brand. I wonder if others have died during testing or if the cell phone interference that Cooper and his mother inadvertently caused was a unique event. Maybe it's just a personal thing. I scare easily and avoid most horror movies, but this didn't give me so much as a shiver. I think the meta elements gave me a buffer; I feel the same way about Cabin in the Woods. Oh it's not just you. I did a quick search online and no one seemed to like this episode. Or at least, none of the top searches for "Black Mirror Playtest Review" gave it more than an average rating. Cabin in the Woods also scared the bejeezus out of me. As a huge fan of horror movies and video games, this was close to being one of my favorite episodes. Unfortunately, I didn't really buy that final ending. They should have just ended it with him about to walk into his mom's room or something. Points for the dramatic irony ("Called 'Mom'"), but it was just too much. Otherwise, excellent episode. It pokes fun at so many horror tropes; the whole spend the night in a haunted house plot. And Wyatt Russell carried it with his energetic performance, he's definitely his father's son; Cooper had a real Jack Burton vibe. I thought the meta stuff would downplay the horror too (a la Cabin in the Woods; LOVE), but nope. I was on edge for most of the episode and was freaking out as much as the main character when things got crazy. This is my least favorite episode so far. The protagonist isn't a bad person, but he is an irritating one, and watching him alone in the "haunted house" waiting for something to happen was dull. Other than the brief part where he was attacked with the knife, I never found it scary. And after that point his histrionics just annoyed me because I just didn't empathize with his panic.